Bernstein’s philosophy and treatment of those on the autism spectrum are depicted in his book, which is based on over three decades of working in his New York practice with children and adults, almost all of whom also didn’t talk. His greater contribution, however, may well be the book itself, because Uniquely Normal illustrates to parents and professionals an alternative to what is the most highly-funded and practically mandated therapy today for early intervention for autism: ABA therapy. Dr. Grandin, the most famous person with autism in the world, wrote the Foreword to Uniquely Normal. Bernstein’s fascination with those who are “different” developed because he had an older brother he admired, even though his brother fell into the category “of speaking bluntly and infrequently,” before most anyone recognized the characteristics of autism. The author gravitated into the field in his undergraduate and graduate studies at Teachers College, Columbia University, after which he developed his practice based on learning theories of giants in the educational field, John Dewey and Jean Piaget. The rest of the book is comprised of 27 case studies organized in different age groups to illustrate the various techniques he’s used to gain entry into their perceptions and actions in order for them to gain understanding of others as well as themselves. “Bernstein’s Uniquely Normal has mapped out a practical path for parents to increase the skills and independence of kids on the autism spectrum while respecting their ways of experiencing the world, supporting their autonomy, and avoiding the traumatizing methods of ABA and other purely behavioral approaches,” states Steve Silverman, the author of Neuro Tribes: The Legacy of Autism and the Future of Neurodiversity. Bernstein will be available for speaking and book signing events at book stores and other venues, including academic institutions, beginning in December 2017. Future Horizons, Inc. publishes Uniquely Normal. Interviews, photos, and/or background material can be arranged by contacting Lyn Dunsavage Young, Media Coordinator, Future Horizons, Inc. at lyn@fhautism.com or 88.489.0727. 1. Rob Bernstein's book presents a ground-breaking, clear, and well-reasoned alternative approach to working with children, adolescents, and adults with autism spectrum disorders. A must-read for parents, psychologists, teachers, and those who care for and nurture individuals with ASD. - Steven L. Strauss, MD, Neurology; PhD, Linguistics; Diplomat of the American Board of Psychiatry and Neurology; Former Professor of Neurology at the University of Maryland, currently in private practice in Baltimore, Maryland. CORRECTION: Dr. Strauss has not "received the John Dewey Award for Excellence in the Teaching of Children from Middlebury College," and he has not attended or taught at Middlebury College, which also does not have the John Dewey Award at its institution. 2. Any reader who has been drawn in by Oliver Sacks' marvelous case studies will be drawn to Rob Bernstein's new book, Uniquely Normal. Bernstein, a born storyteller, brings his experiences with autistic children to life so that any parent or caregiver will be inspired and guided to try his tested approach to affect profound change in their loved ones. His book teaches behavioral and speech strategies that shift patterns of behavior and yet honor the individuality of each child. In this extraordinary work Bernstein employs vivid case studies – transformed into compelling stories – to revolutionize the way parents and caregivers think about and treat autistic children. 3. Rob Bernstein offers a compelling and engaging model in the treatment of autism. This is an enjoyable and informative read for anyone who has a person with autism in their life. 4. Bernstein’s methodology, developed after years of experience in the present educational system that clearly fails most of these individuals, demonstrates a revolutionary cognitive approach to autism that departs from current practice. It is a must read for all parents and professionals dealing with autistic children. 6. Without exception, Rob Bernstein’s work with these patients has markedly improved their ability to function effectively with others. He has a unique ability to engage with people, gently yet firmly coaxing them into the wider world, often for the first time. Once there, he guides them toward claiming their competence and channeling their untapped strengths. I stand behind Rob Bernstein’s techniques without reservation. 7. 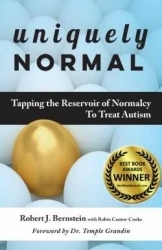 Uniquely Normal provides astounding insights into the fascinating minds on the autism spectrum, and much-needed guidance to parents of neurotypical and atypical children alike.